BANGI, 23 Oct 2012 – The National University of Malaysia (UKM) is well-placed to contribute to a new phase of Islamic civilization which is likely to get more global attention as Western culture becomes embroiled in crisis. 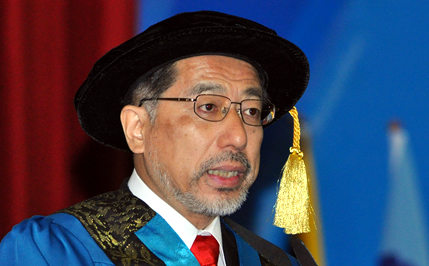 Profesor Dr Kosugi Yasushi, who was conferred an Hononary Doctorate in Philosophy from UKM at the seventh session on the final day of its 40th convocation today, said Malaysia should also show its mettle and provide the ideal model for a just civil society to the world. Prof Kosugi, who is from Kyoto University, Japan, said the international community is becoming disillutioned with Western civilization with its extreme materialism and double standards. It is high time that Malaysia and other South-East Asian Islamic nations step to the plate and prove that Islam stands for Peace and Prosperity. Speaking after being conferred the honour by UKM Pro-Chancellor, Tengku Ahmad Rithauddeen Tengku Ismail, he said although Mecca and Medina are the spiritual focus of the Muslim Ummah, the economic, political and knowledge centres of Islamic communities change throughout history. In the past Damascus, Baghdad, Samarkand and Istanbul became known for innovation, science and commerce but now comes a new phase of Islamic civilization that could be spearheaded by Malaysia and UKM which are already developing Islamic banking and Shariah application in economic matters. Prof Kosugi, a Muslim convert, praised UKM’s Institute of Islam Hadari which is providing a more progressive view of Islamic Civilization through research and information. He also expressed confidence that the networking already in place between Kyoto University and UKM will be productive. Two graduate students from the University are already at the Institute of Islam Hadhari to learn more about Halal Certification and Islamic Science while the UKM Institute plans to place two of its students at the Centre for Islamic Area Studies in Kyoto University. Joint research between the two institutes in Islamic Civilization is also in the pipeline. Prof Kosugi’s interest in Islam prompted him to learn Arabic at Tokyo University in 1972. Three years later, the Egyptian government granted him a scholarship to pursue a special course in Islamic studies and in 1983 he obtained a degree in Usuluddin from Al-Azhar University. He also embraced Islam in Egypt. Prof Kosugi admitted that many people thought it unusual for an ethnic Japanese to be a scholar and academic of Islam let alone a convert of Islam but accepted it as being part of life and career. In 2008, a year after the Institute of Islam Hadhari was set up at UKM, Kyoto University took the opportunity to initiate a networking with UKM. Prof Kosugi has often been invited to conferences and discourses at international level, including the Islamic Foundation of Cambridge University and Durham University, United Kingdom. He began his academic career at the International University of Japan, as an assistant researcher and later became its Senior Research Fellow. He was apoointed as Secretary of the Institute of Middle Eastern Studies of Japan and later appointed as Professor at Kyoto University. Prof Kosugi was a visiting scholar at the Centre for Middle Eastern Studies, Cambridge University and in 1988 appointed as Director and Professor at the Centre for Southeast Asian Studies, in Kyoto University. He is currently the Director of the Centre for Islamic Area Studies and Graduate School of Asian and African Area Studies at Kyoto University. He is also a member of the Japanese Science Council.